Two Chicks On Books: Blog Tour- DARK BREAKS THE DAWN by Sara B. Larson An Interview & Giveaway! Blog Tour- DARK BREAKS THE DAWN by Sara B. Larson An Interview & Giveaway! Hey everyone! I am thrilled to be hosting a spot on the blog tour for DARK BREAKS THE DAWN by Sara B. Larson! I adore Sara and this book and I can't wait for the next book!! I have an interview with Sara to share with you today! And make sure to enter the giveaway below! Haven't heard of DARK BREAKS THE DAWN? Check it out! Hi Sara! First I want to say welcome back to Two Chicks on Books! I freaking loved the DARK BREAKS THE DAWN and I can’t wait for everyone to read it! And I am so happy that you could stop by for a visit! Thank you so much! I’m so thrilled you loved it and I’m so happy to be back! 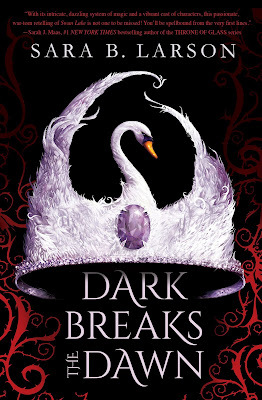 For the readers: can you tell us a little bit about the DARK BREAKS THE DAWN and the characters? DARK BREAKS THE DAWN is a fantasy reimagining of Swan Lake. There are so many complex characters in this story that I loved getting to delve into and write about—including Evelayn, the Princess of Eadrolan (the Light Kingdom), Ceren, her best friend who is more like a sister to her, Tanvir who is the new High Lord of the Delsachts, and Lorcan, the Prince of Dorjhalon (the Dark Kingdom). All of these characters have strengths and weaknesses, many of which you’ll see in DBTD, but that will be revealed even more (and sometimes in VERY shocking ways) in the sequel, BRIGHT BURNS THE NIGHT. How was writing it compared to the Defy series? Is it different writing a second series? Writing this duology has been a very different experience from writing the DEFY series. I was able to draft the three books of the DEFY trilogy very quickly, often in huge spurts of inspiration that lasted for hours. With DARK BREAKS THE DAWN and the sequel, I was dealing with quite a lot in my personal life, and found it much harder for that same creative passion to overtake me. This meant that both books took longer to draft than I had been used to, but it was a great learning experience for me—that I can still write and create, even under less than ideal circumstances. Not really. I think as authors, we are constantly observing and absorbing, but I have yet to consciously model a character after someone in my real life. But perhaps “stealing” bits and pieces here and there, yes. I think we all do that. Besides Evelayn, my main character, I think my favorite was Lorcan. He is so complex and has such a difficult life. He demanded much more attention than I’d first anticipated giving him and actually threw me for some major loops in this book and the sequel. While it can be terrifying as an author to give a character “his head” so to speak, it is also exhilarating, and I can’t wait for everyone to get to know him. What is your favorite passage/scene in DARK BREAKS THE DAWN? I can never pick just one – there are so many! And some are very spoilery. But one of my favorite scenes to write takes place in a cave, when Evelayn risks her life to go seeking something to help her stop the war. I did all sorts of different research, but one of my favorite bits of “research” I did was when I was lying in a hotel room, trying to rest while my kids watched Wild Kratts on PBS. It was an episode about spiders, and in particular how strong spider silk is. That episode sparked an idea that became an integral part of the plot in DBTD! You never know where inspiration (and research) can take place! I’m terrible at picking just one…but some of my recent favorites are Rhysand (ACOMAF), and Anton (BURNING GLASS). Very different men, but both very swoon-worthy! I’ve always naturally gravitated to YA, as a reader and a writer. I love the urgency at this time in a person’s life, when characters are experiencing so much for the first time—love, death, independence—and when they are figuring out who they really are and want to be. My TBR is a mile high! As soon as I finish editing BRIGHT BURNS THE NIGHT, I am currently dying to read FLAME IN THE MIST, THE STAR TOUCHED QUEEN, A COURT OF WINGS AND RUIN, and my ARC of CRYSTAL BLADE! I always end up in Gryffindor when I take the tests. Instagram. J I love pictures. I don’t have a TOP favorite, but I did just binge watch How I Met Your Mother and Heart of Dixie while I was on bedrest (I needed light, fun shows to keep my mind off of things) and thoroughly enjoyed both. Sweet. Unless it’s chips with salsa and guacamole. I can’t stand the sound of napkins tearing, so I hate using paper napkins. SO many! Guardians of the Galaxy 2 and Wonder Woman are at the top of the list! And of course THE LAST JEDI!!! Thanks so much Sara for answering my questions! I can’t wait for everyone to read DARK BREAKS THE DAWN! SARA B. LARSON is the author of the acclaimed young adult fantasy Defy trilogy: Defy, Ignite, and Endure. She can’t remember a time when she didn’t write books—although she now uses a computer instead of a Little Mermaid notebook. 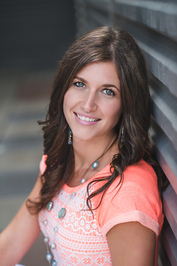 Sara lives in Utah with her husband and their children. She writes in brief snippets throughout the day (while mourning the loss of nap time) and the quiet hours when most people are sleeping. Her husband claims she should have a degree in “the art of multitasking.” When she’s not mothering or writing, you can often find her at the gym repenting of her sugar addiction. 3 winners will receive a finished copy of DARK BREAKS THE DAWN. US Only. I love the idea of a Swan Lake retelling. Dark Breaks the Dawn sounds great.